Originally designed and built in-house by SafeSmart for a Papua New Guinean helicopter company who services major industries in the nation. 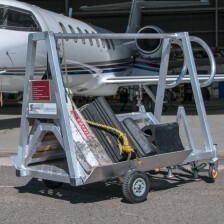 Eliminating unstable step ladders and ladders, this system encompasses all critical service points on the client’s Airbus H145 via two hand-manoeuvrable platforms. Due to the slope of the top of the aircraft, these platforms were designed with two levels – for top engine access and to the higher rotor head. High-tensile aluminum keeps the platforms light enough to move around quickly as well as weather-resistant in the PNG humidity. 45-degree stairs make access underfoot more balanced than that of a step ladder. And a large side cantilever clears the skids at ground level. Added to this design are also 260mm solid rubber wheels with wind-down jacks for securing on rough terrain if needed. 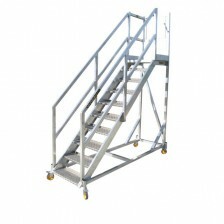 For a quote or measure-up on a maintenance platform design for your Airbus helicopter, ask SafeSmart Aviation now.